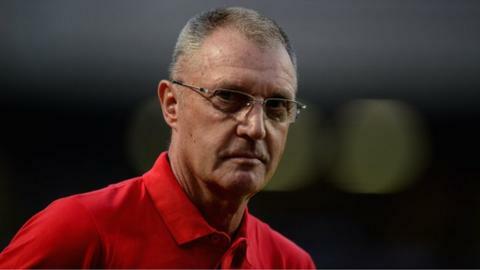 Former Netherlands World Cup captain Ruud Krol has signed a one-year deal to coach Libyan side Al Ahli Tripoli. He takes the job only four months after he was sacked as coach of Tunisian club Esperance, following a disappointing start to their African Champions League group phase. Krol has worked extensively across Africa, having held positions in Egypt, South Africa and Tunisia. He is expected to join up with the 11-time Libyan champions on 1 November. "It came out of the blue," Krol told Voetbal International in his native Netherlands. "I have an idea of what I have to deal with. We have seven Libya internationals, who have all done well in Africa [in the CHAN] and the squad consists of forty men. "We will start in Tunis and then maybe spend some weeks in Cairo and Dubai, with the help of the club president." Krol, who was interim coach of the Tunisian national side when they lost 4-1 to Cameroon in their 2014 World Cup play-off, is aware of the unrest in Libya which has grounded domestic football. "This role is about the African Champions League, which usually begins in late February, early March.," added the 65-year-old. "Until then, I will make do with friendly matches because I've been given a free hand to work. "I will definitely travel to Tripoli, but 80-90% of our matches will be played outside Libya." The unrest in the country has not deterred Krol. "In Tripoli things are a bit calm and Spanish coach Javier Clemente has had a training camp for the national team there," he said. As well as leading CS Sfaxien to the 2013 Confederation Cup title, he also helped them win the 2013 Tunisian title ahead of Esperance, the club he joined in January 2014. But Esperance, the most successful club in Tunisian league history, fired Krol five months into his three-year deal in May after a disastrous African Champions League campaign. He led Egyptian side Zamalek to victory in the Egypt Cup in 2008 and won the South African championship with Orlando Pirates in 2011.